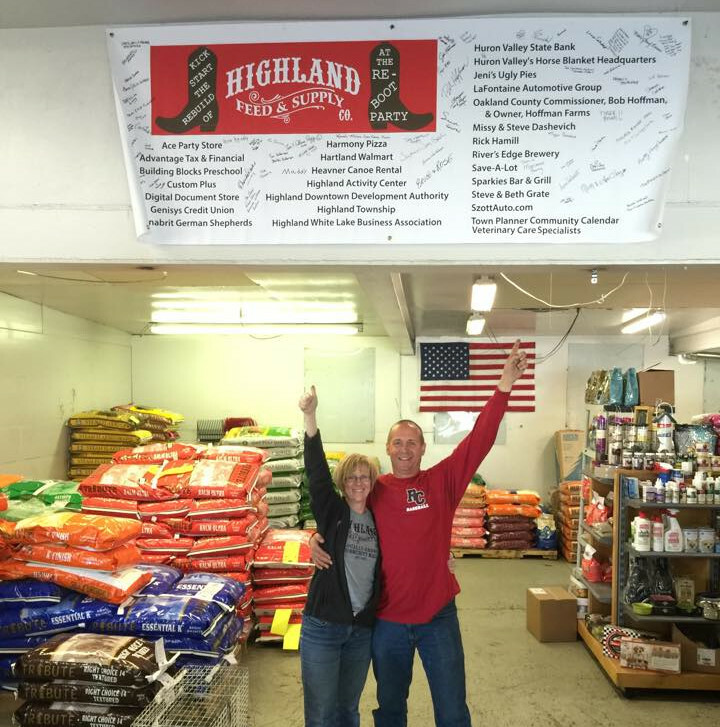 Highland Feed has been a part of downtown Highland for over 100 years. Though it has gone through a few name changes, the local hometown feel has remained true. Owners Mike and Debbie Maher have been residents of Michigan their entire lives. Our family has been involved in the 4H since 1999 and has owned a small family farm as well. On our farm we have raised 45 egg-laying hens, over 400 broiler chickens, 20 steers, 30 pigs, 5 goats, 25 turkeys, and 2 rabbits. Our family also has 3 wonderful dogs and a cat. We take pride in the fact we are very familiar with so many different animals. They are truly our passion and we’d love to share our knowledge with you. We have a variety of products not limited to only feeding your animals and lawns. We have feed for every farm animal, pet food and supplies, bird seed and feeders, horse tack, hay and straw, animal bedding, softener salts, lawn and garden products, bulk garden seeds, grass seed, and much more. If we don’t stock it, feel free to ask, we will do anything we can to fill any request. Our new Maher Feed & Pet Supply store was completed December 17, 2016. You'll find the same great products, and the same great staff at our store. In addition to many new items for sale! We also just added a Grooming Service in our Highland location. Whether you're shopping at our Holly location or Highland location, you won't be disappointed with the products and service you'll experience!